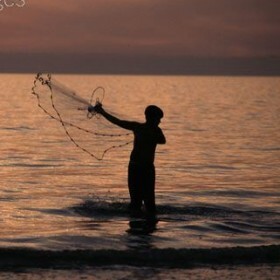 Jesus said to Simon, "Put out into the deep water and let down your nets for a catch." Simon answered and said, "Master, we worked hard all night and caught nothing, but I will do as You say and let down the nets." When they had done this, they enclosed a great quantity of fish, and their nets began to break. In February of 1986, Jules Dervaes expressed a personal concern in a letter written to the head of the church of which he was a member. A series of letters followed, written over the next nine months to the church authorities. At that point, in October, 1986, his membership in the church was revoked through his being disfellowshipped. This forced separation, both organizational and social, signaled an end to the private phase of his search for truth. Thereafter, Mr. Dervaes’s endeavor to get answers entered a public phase with the writing and distribution of seven letters (“scrolls”) to the ministers and members during the period December, 1986, through January, 1988. All the while, private correspondence with church officials continued. After the seventh scroll was delivered, Mr. Dervaes took a step further by displaying banners and signs on the streets around the church headquarters, beginning in the Spring of 1988 and ending in the Fall of 1991. This campaign lasted three and one-half years. In 1998, these private and public letters, scrolls, and signs were compiled and distributed in a book entitled THE HIDDEN YEARS. In 1999, this body of work was made available on the Internet; and, in 2000, a new website was established, Via del Rey.com. Also, a booklet containing the scrolls, THE LETTER TO LAODICEA, was published in 2001, commemorating 14 years since Mr. Dervaes wrote his first letter. Now, there is unfinished business which has to be taken up through this most recent website, Sword of Joshua, in preparation for the work yet ahead. The church Mr. Dervaes witnessed to all these years has been ‘shipwrecked,’ splintering into thousands of pieces. The world which had been degrading over millennia is hastening toward such a severely critical state that the future of life on earth is in doubt. Because of the signs pointing to an approaching cataclysm, shouldn’t the believers in the Bible be anticipating the Kingdom of God?